With stunning sea views, immaculately landscaped grounds, world-class security and exclusive lifestyle, Royal Westmoreland is an experience to be relished on a holiday or cherished as your luxury holiday home. Embrace the local culture, improve your golfing game, or simply enjoy the ocean views, it is setup for the perfect Barbados retreat. Winding gently around the magnificent colonial clubhouse is Royal Westmoreland's amazing championship golf course, a layout of an amazing beauty. Designer Robert Trent Jones Junior believes it to be the purest and most rewarding of any he has created, which is high praise indeed, considering his resume. Trent Jones Junior was commissioned to create a masterpiece, whilst retaining the original character of the land; as such, the ravines and the traditional coral quarry have been worked into the layout to create some truly fascinating holes. Among Royal Westmoreland's innumerable admirers is Ian Woosnam, US Masters champion, Ryder Cup captain and local home owner, who is particularly fond of the short holes. The 5th and 6th are special, while the 12th is the dramatic signature hole, with a small green flanked dangerously by a ravine. From the elegant clubhouse, visiting golfers will enjoy views all the way to the turquoise waters of the Caribbean from this tropical gem of a course. Trent Jones Junior loves Royal Westmoreland because it demands every club in the bag, so being creative is essential. 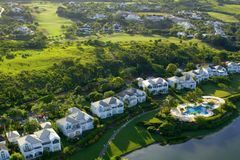 Royal Westmoreland prides itself on offering the most desirable deluxe private holiday villas in the world, all built around the spectacular Robert Trent Jones Junior golf course. The rental villas range from two to four bedrooms, with a range of styles to suit every demand. The Royal Villas are delightful detached units, featuring high vaulted ceilings, full air-conditioning, private terraces and some have a swimming pool. Designed by architect Ian Morrison, the Royal Villas are set amid stunning exotic gardens, and represent true luxury and privacy. The Resort Club Villas are divided between the Cassia Heights and Forest Hills areas of the Royal Westmoreland community, and are modern two-bedroom apartments, decorated and furnished in a traditional Caribbean fashion. All benefit from a large open plan seating area, fully fitted kitchen and a private terrace. The Cassia Heights properties are close to the clubhouse and The Sanctuary, and overlook Coronation Lake, while the Forest Hills development affords amazing views over the beautiful Caribbean waters. New in 2007 are the Royal Collection Villas at Palm Grove 1. These four-bedroom deluxe properties border the golf course, and are complete with luxury extras including a 4-seater golf buggy. Ideal for larger parties and families, accommodation comes no more elegant. The facilities at The Sanctuary are available exclusively to Royal Westmoreland guests, and they include outdoor and indoor swimming pools for both adults and children. Also on offer is the Kidz Club, which has endless activities, scheduled aerobic classes such as yoga and Pilates, a well-equipped gym and the resort's tennis academy. The outstanding health and beauty treatments of the Indulgence Spa can also be enjoyed in the privacy of your own villa, or alternatively enjoy the complimentary access to the West Coast beach at the Colony Club. The Royal Westmoreland resort offers dining options including the elegant Clubhouse Restaurant, the informal Sanctuary Café and for golfers, the Halfway House. Properties for purchase can top a staggering £10 million, with notable private owners including Freddie Flintoff and Gary Lineker.